The idea behind the California Re-entry Institute (CRI) is to begin the re-integration process in prison and continue support services once released. 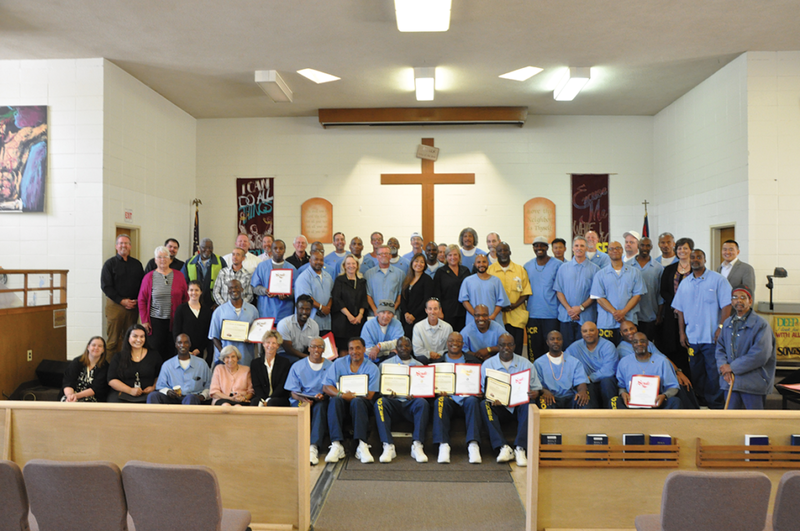 The 18-24-month-to-the- gate program recently graduated more than 50 men in San Quentin State Prison’s Garden Chapel on Sept. 7 from its two programs of Crime Impact Awareness and Empowered Re-entry. “It’s amazing the work they’ve done,” CRI executive director Collette Carroll said. “They come every Saturday. They work hard. They share. They ask for case management. Vincent Russo who was born the same year (1993) that his father went to prison, spoke of the potential of CRI at the graduation. Russo explained the cost/impact of incarceration on the family. Russo’s message is that the shame of a criminal history need not limit the potential of a returning citizen. “When we visited, I remember waiting until the end to try to take my dad home with me,” he added. Quinton C. Walker, a CRI inmate-facilitator explained how to apply for CRI. “You go to education and fill out the form for CRI,” he said. “The average wait is now about two years. We respect those that wish to join and strictly follow our wait list. CRI’s curriculum uses individualized case management and personalized parole planning to assist participants on issues such as emotional needs and addictions, as well as personal empowerment and financial literacy. Carroll with CRI Facilitator Eddie Herena and Facilitator Cindy A. “What makes CRI’s Empowerment Reentry Program unique is not only does it help it’s participants understand emotional intelligence while bringing community resources to them, upon release offers a safe place at Roland’s House.” said CRI inmate-facilitator Eddie Herena. CRI looks to the past as well as the future in helping participants with personal transformation through its curriculum. CIAP helps offenders understand the impact of their crimes upon victims. For Carroll, CRI is a legacy that reaches back to her husband, who volunteered at San Quentin for nearly 30 years before he passed away. She shared this moment with the new graduates of CRI. Graduates: Empowered Re-entry Program & Crime Impact Awareness Program: Stanley Baer, Louis Daniels, Eddie DeWeaver, Bruce Fowler, John Gillies, David Gonzalez, Frederick Guest, Joseph Hancock, David Irby, Eric Johnston, Dwayne Jones, Gary Kosta, Philip Senegal, Somsak Uppasay, Bobby Williams, Douglas Wynn, Jonny Gomez and Charles Spencer. Empowered Re-entry Program: Anthony Faulk, Carlos Smith, Christopher James, Craig Wimberly and Reginald Wimberly. Crime Impact Awareness Program: Andrew Gazzeny, Claudius Johnson Gary Harrell, Eddie Wills, Kevork Parsakrian, Lee Conley, Mark Tedeschi, Marty Spears, Orlando Harris, Richard Benjamin, Richard Lathan, Roger Chavez and Ronald Coleman. CRI Grad David Gonzales with Facilitator BillI I.